SEND FREE SMS... unlimited, from Internet and guaranteed delivery! 100% guaranteed delivery! Quality and speed in your communications. 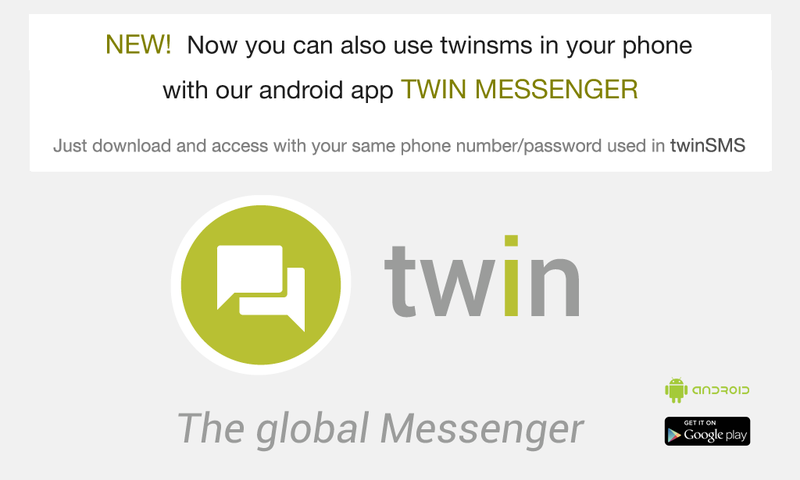 With twinSMS you can send free sms to any mobile operator, as well as send free sms to other countries. Free registration and start enjoying the service of sending international free sms. Send your sms online quickly and easily with your online sms delivery confirmation. twinSMS is your personal best platform to send international free SMS, your free SMS worldwide. Send free sms was never so easy and simple. Send free SMS to cell phones of any operator... Movistar, Orange, Vodafone, Ono, Simyo, Yoigo, Jazztel, Amena, Euskaltel, Lebara, Pepephone, Más Móvil, Tuenti Móvil, Blau... always with delivery guarantee, twinSMS, the free SMS operator and instant messaging service. Property of MercadoPC Iberia S.L, registered in Trade Register of Alicante, Volume 3185, Book 0, Folio 46, Page A-106545, Entry 2ª C.I.F B54237151 and registered in the Registry of Electronic Communication Network and Service Providers CMT (Telecommunications Market Commission).